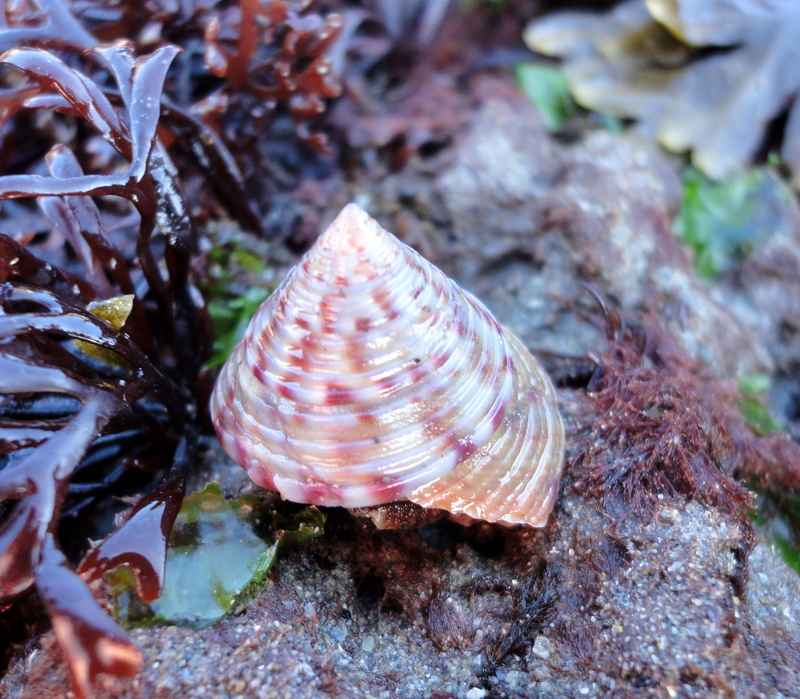 February is a wonderful month for rock pooling in Cornwall. Well, we think so, although we consider a packet of chocolate biscuits a pre-requisite for achieving anything, especially enlightenment, so we pop into the Spar shop on our walk to the beach. The lady in front of us eyes my son’s bucket and spade with disbelief. Noticing her interest, he announces his plan to dig a mine for tin and copper, just like the Celts. “You can come too!” he smiles, confident that his offer is too good to turn down. The lady returns his smile, but politely declines. 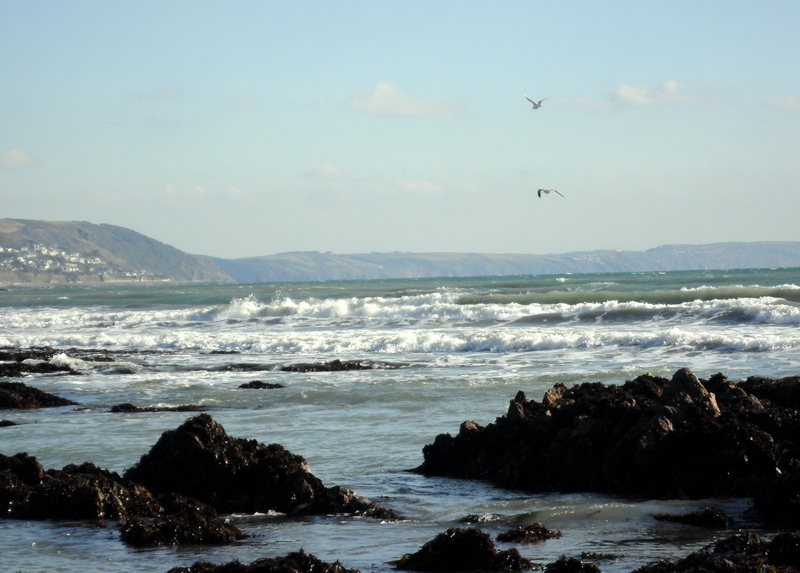 Plaidy in February – bliss. Plaidy beach today is perfect, sheltering from the biting northerly wind beneath low, folded cliffs and a space-blue blanket of sky. The sun has warmed a broad strip of sand for my little miner and a stream cries out for a dam. Beyond the sand a vast expanse of rock pools twinkles in invitation, but we make time for a chocolate biscuit or three before we set to work. 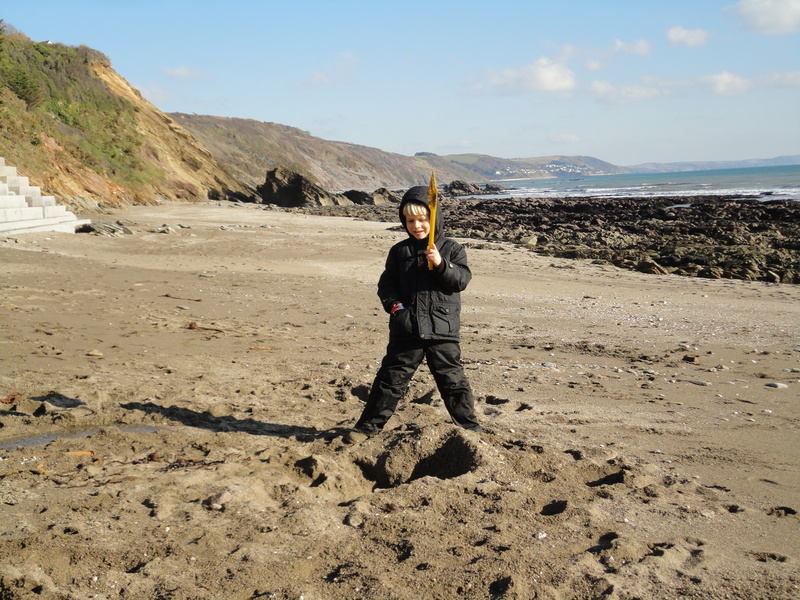 Quiet time is a rare luxury, so I make the most of Cornish Rock Pool junior’s digging project to steal some time for my own explorations. An empty February beach offers a different kind of pleasure from busy summer events; it’s a meditation on the moment, on the immediacy of each rock, gulley and pool. 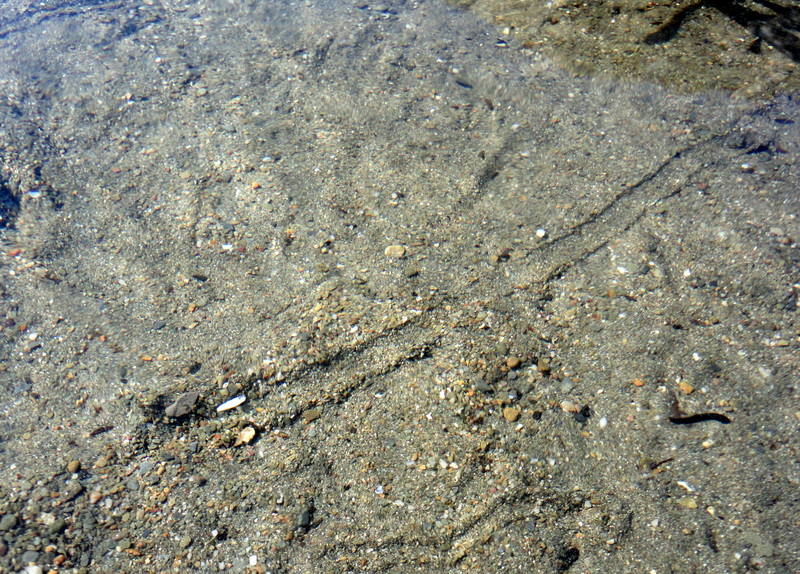 It’s easy to see the sand trails across the bottom of undisturbed pools. 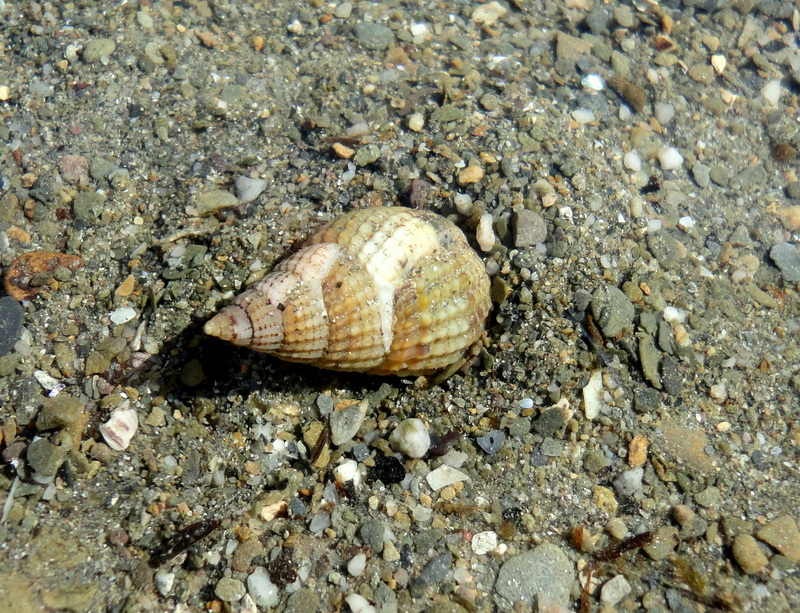 I find common periwinkles and netted dog whelks carving the tracks, like tiny pioneers laying railroads across a desert. I watch them inch forwards, grazing for algae and micro-organisms, shovelling sand back as they go. Fish are few and far between, probably sheltering in deeper, warmer water. Soon they’ll be moving back in for the breeding season. In the meantime fat prawns rule the roost, lazing under boulders and lurking among seaweed that has survived the winter storms. The crab population is thriving here, as always. 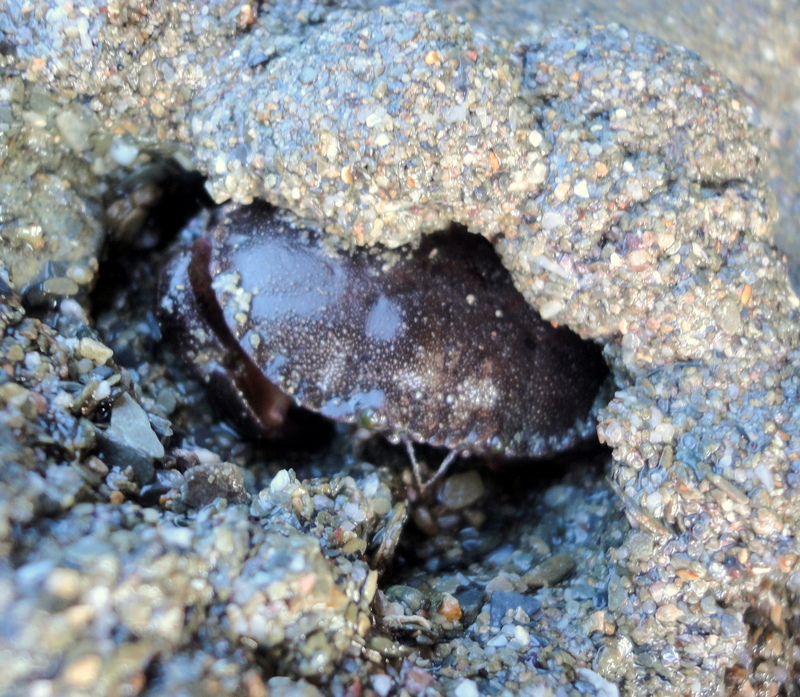 Gangs of broad clawed porcelain crabs cling to the underside of the rocks, a giant velvet swimming crab paddles over and nestles under my welly. An edible crab eases back, burrowing into the sand, while another, larger one, is deep in a crevice, issuing tell-tale clicks. 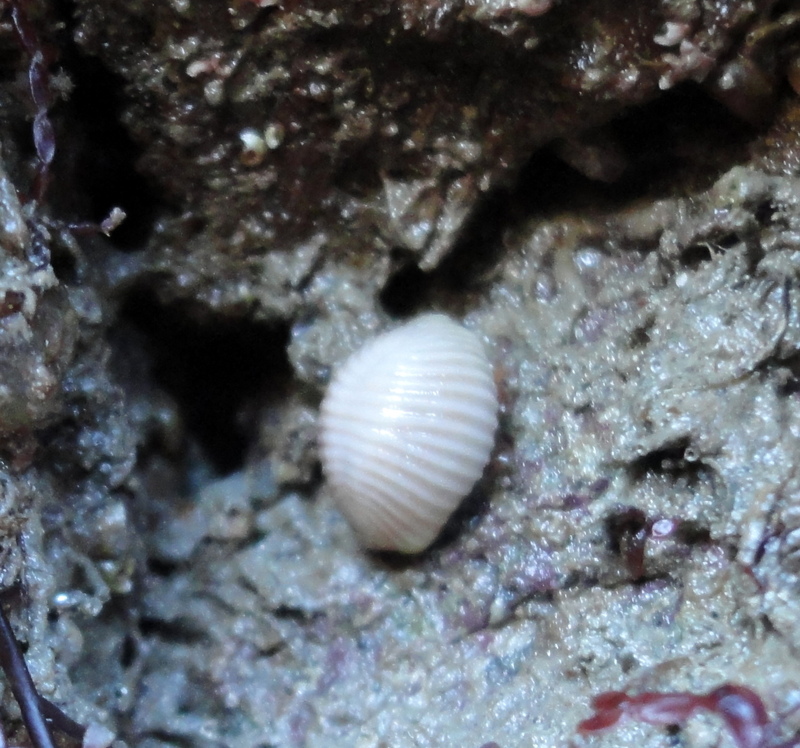 Even in winter there are colourful treasures to be found: the tiny white Arctic cowrie; the ornate spire of the painted topshell and, joy of joys, a blob of jelly. I’m a big fan of blobs of jelly and this one is perhaps half a centimetre long, browny-purple and shapeless. I place it in water and await the magic, still unsure what it will be. Within seconds it is unrolling, stretching out and taking a new form. 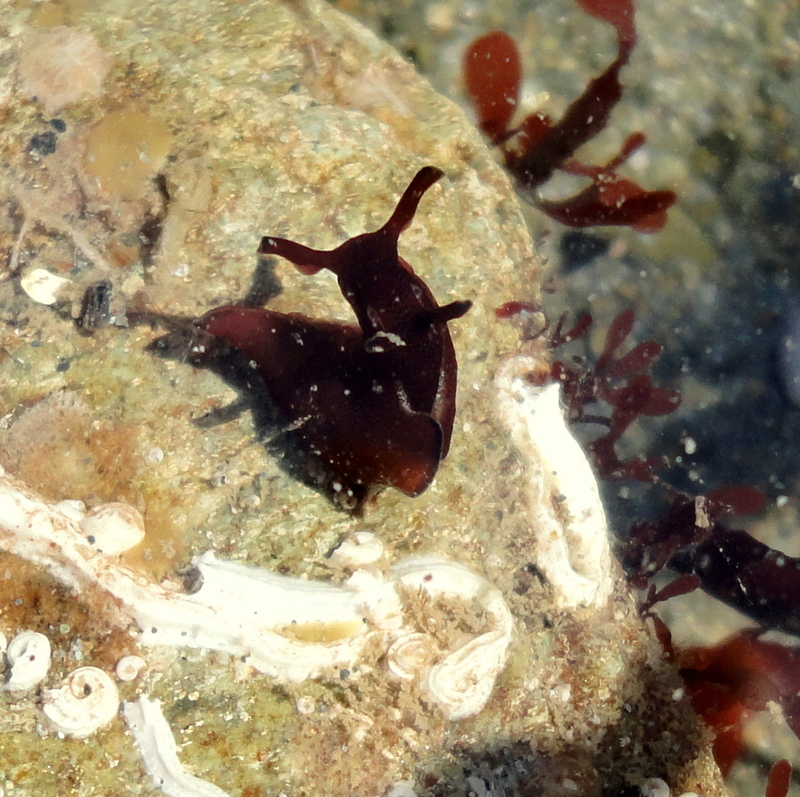 It unfurls two long ‘ears’ and becomes a baby sea hare – a type of sea slug. These animals seem fragile, ill-adapted for life at sea; even when they’re fully grown they are soft bodied and unable to swim. However, they do have some cool tricks. Like their distant relatives, the squid, they can fire out a cloud of purple ink when disturbed and they’re fantastically well camouflaged among the red and brown seaweeds, which this little creature proves by oozing off and disappearing. A dog walker steps out across the beach glancing at my son. She hasn’t spotted me here among the high rocks, she just sees a lone child digging out a pit, but he’s grinning and chattering, inviting her to join him so she leaves him to it. We soon have the beach to ourselves again. Oystercatchers flit past with a whistle as the tide starts to turn. My son gives me a tour of his mine workings, a series of holes, shafts and mounds. We warm ourselves in the afternoon sun, flicking through my photos and nibbling on biscuits. Neither of us is in a hurry to break the spell of a quiet beach on a quiet day. Lunch can wait. Everything can wait. 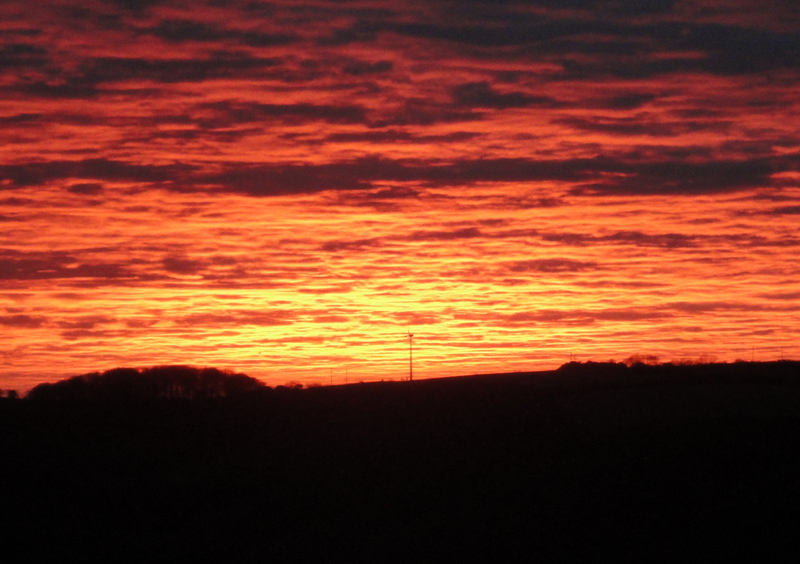 And a perfect sunset when we got home – these are the natural colours!